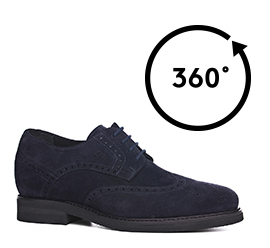 Classic elevator Derby shoe with upper in dark blue suede featuring distinctive hand perforated designs. The Vibram rubber sole ensures maximum comfort. Essential for winter, this shoe has an invisible inner elevator system able to increase the total height up to 3.1 inches (8 cm) in style and secrecy. Made in Italy.